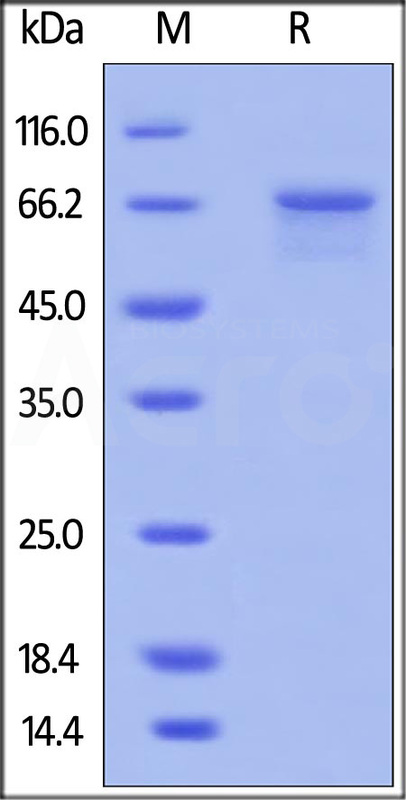 Matrix metalloproteinase-2 (MMP-2) is also known as 72 kDa type IV collagenase, 72 kDa gelatinase, Gelatinase A and CLG4A, which belongs to the peptidase M10A family. MMP-2 / CLG4A contains 3 fibronectin type-II domains and 4 hemopexin-like domains. MMP-2 is produced by normal skin fibroblasts. MMP-2 cleaves the collagen-like sequence Pro-Gln-Gly-|-Ile-Ala-Gly-Gln. MMP2 involved in diverse functions such as remodeling of the vasculature, angiogenesis, tissue repair, tumor invasion, inflammation, and atherosclerotic plaque rupture. As well as degrading extracellular matrix proteins, can also act on several nonmatrix proteins such as big endothelial 1 and beta-type CGRP promoting vasoconstriction. Also cleaves KISS at a Gly-|-Leu bond. Appears to have a role in myocardial cell death pathways. Contributes to myocardial oxidative stress by regulating the activity of GSK3beta. Cleaves GSK3beta in vitro. PEX, the C-terminal non-catalytic fragment of MMP2, posseses anti-angiogenic and anti-tumor properties and inhibits cell migration and cell adhesion to FGF2 and vitronectin. Brooks P.C., et al., 1998, Cell 92:391-400. Fernandez-Patron C., et al., 1999, Circ. Res. 85:906-911. Fernandez-Patron C., et al., 2000, Circ. Res. 87:670-676. Bello L., et al., 2001, Cancer Res. 61:8730-8736. Lovett D.H., et al., 2012, PLoS ONE 7:E34177-E34177.